I’m such a sucker for strawberries. First berries of the season and I HAVE to have them. $8 a quart? Sure, I’ll pay whatever you ask, Mr. Farmer. Of course, one quart can’t satisfy my fix, so I keep buying more (luckily after that first weekend, prices get way more reasonable), and pretty much live on strawberries for the month of June. Although this year, I was able to enjoy some in May too thanks to our freakishly mild winter. The growing season’s a bit off and everything is popping up early, which means I might get some tasty Maine blueberries when I’m up there in a few weeks, but that’s besides the point. So far I’ve made strawberries with fresh cream, strawberry ice cream, strawberry pancakes, strawberry preserves, but my favorite? 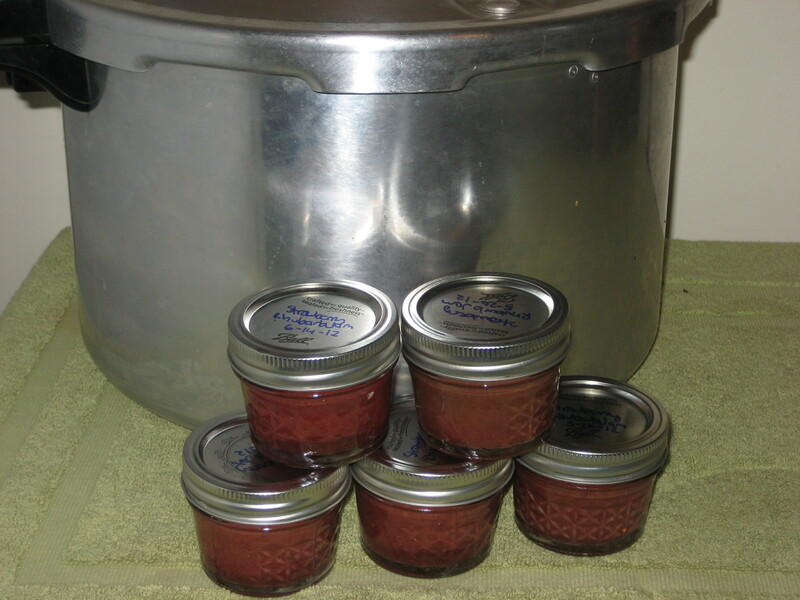 Strawberry Rhubarb Jam. What I didn’t realize until I started caring more about where food came from and how it grows, was strawberries and rhubarb aren’t exactly in the same growing season. They just fit so naturally together, yet rhubarb’s a bit earlier and strawberries come later, so there’s usually a brief window to catch the two. This year they lined up perfectly! 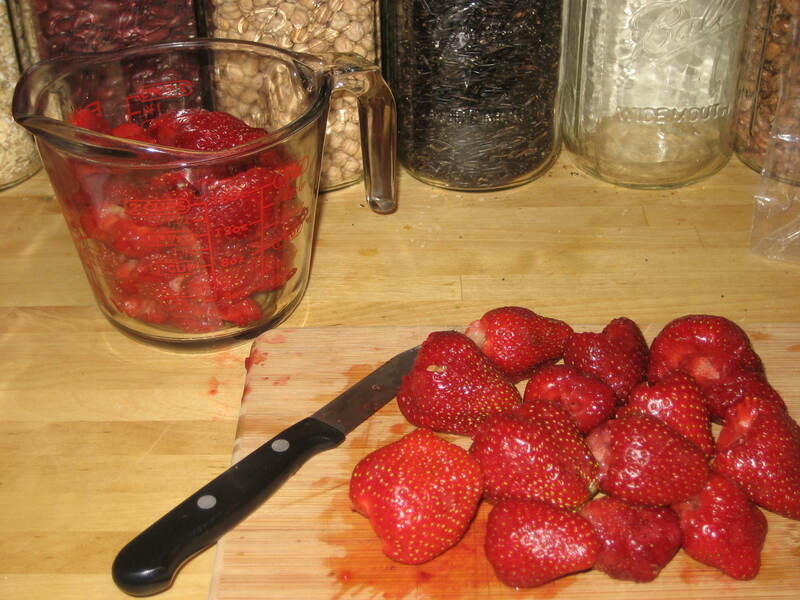 I’ve made two full batches of strawberry-rhubarb jam so far, and if I can wrestle up some more berries, I might just have to make more this weekend. It’s like pie in a jar–no toast or scones even required (though it’s probably a bit more acceptable to serve it on something rather than spoonfuls from the jar like I might…). I got the recipe from one of my many canning books. I’m still fairly new at canning and afraid to mess with the acid levels so as not to get bacteria, so canning might be one of the only things I really follow a recipe for. My favorite part about this recipe? No processed sugar! 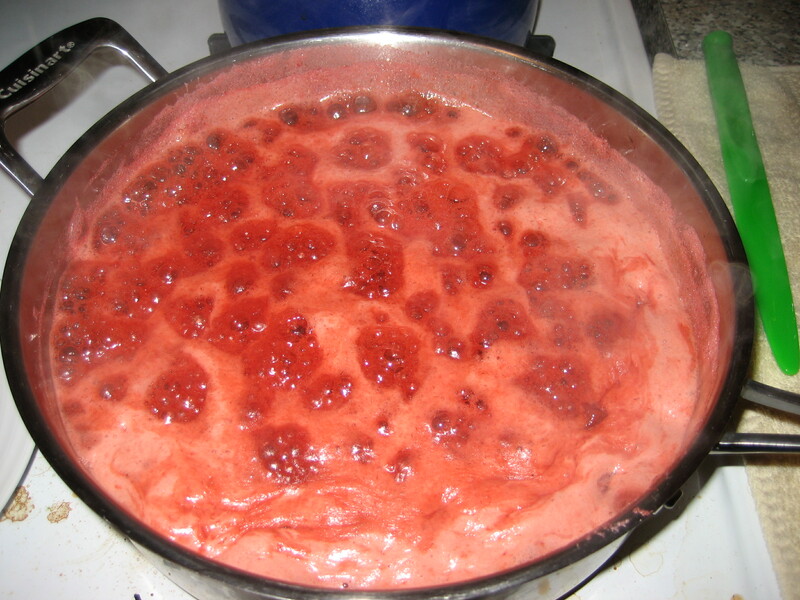 You let your strawberries marinate in some honey for a few hours, then pour that along with the rhubarb, more honey and a splash of lemon juice, then just cook it down for anywhere from 20min to and hour until you get the jam consistency you want. Then process your jars. My husband and I don’t eat too much jam, so I’ve found the 4oz jars as apposed to the 8oz ones are a better size for us, but I have a feeling these will go fast. BONUS: Serve the jam on plain scones with some fresh whipped cream…HEAVEN (sorry, the scones didn’t last long enough to photograph).